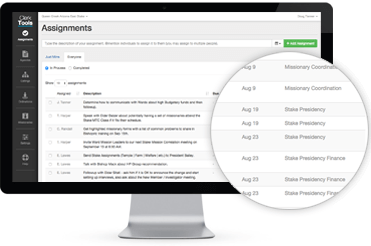 Solutions for administering LDS ward and stake business; allowing you to focus on the ministry. Hasten the work. It's what technology is for. A streamlined system for conducting the business of the kingdom. 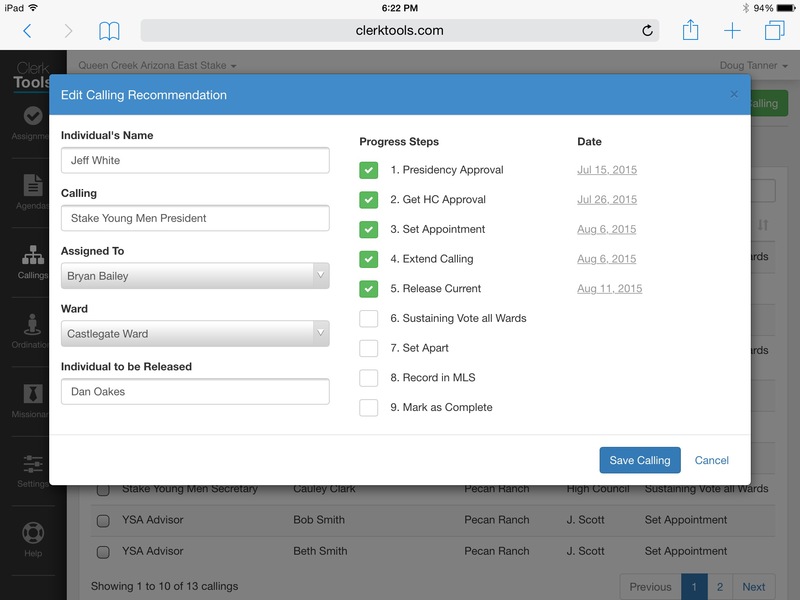 Empower your Clerk and Executive Secretary with the tools they need to do their job. They do a lot to ease your burden. Do the same for them. You'll be more unified than ever before. Maybe all of you can go home a little earlier on Sunday afternoon. How does Clerk Tools help me magnify my calling? Make assignments. See when they get done. Know that the work is rolling forward. Your high councilors already have the sustaining paperwork on their tablets. Your counselor already took care of that setting apart. His phone reminded him. No more shuffling paper. This could be the end of the cubbies in the Clerk's Office. Every needful thing...in its place. 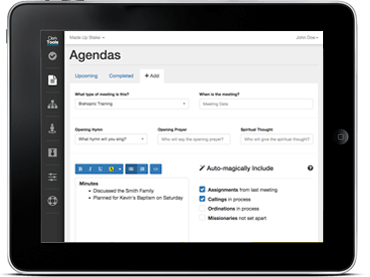 Are you currently tracking callings, ordinations, agendas, and meeting minutes on paper? Maybe they are scattered across some spreadsheets, cloud-documents, and in several different binders and briefcases? Bring all your tracking into one system and access it no matter where you are, on any device. Everything in one place will make a difference. Try it risk free for 30 days. Men are that they might have joy. Give them tools that they'll love to use. Take a look at what Clerk Tools can do. Clerk Tools is wonderful. As a bishop there is so much administration work but Clerk Tools really helps me to be able to focus on the ministry part of my calling. It has enabled our bishopric to keep track of almost everything. 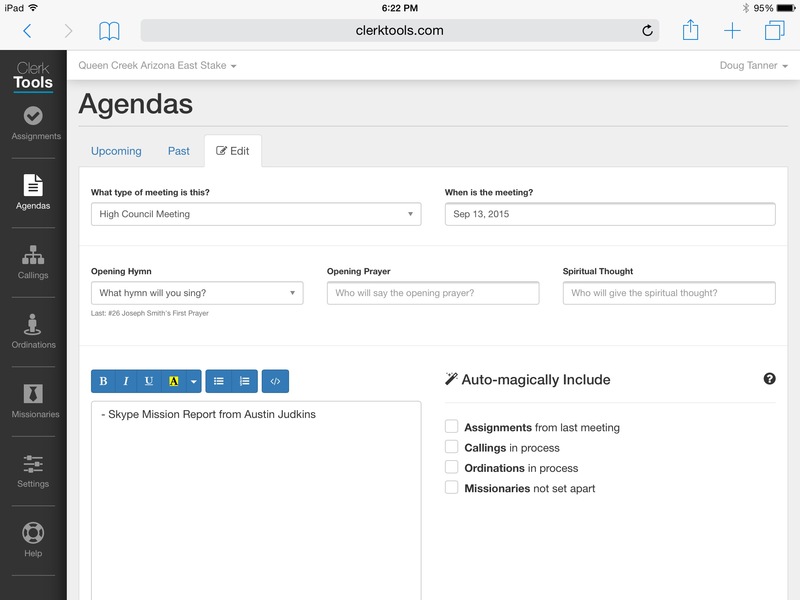 The ease of managing our agendas and assignments has helped us improve our ability to make sure we get things done. I highly recommend it! 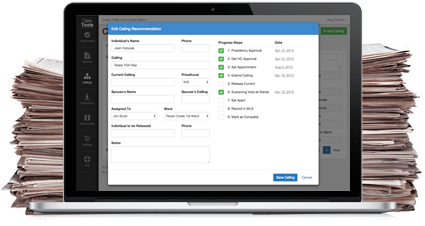 Clerk Tools is a simple, user friendly, and powerful tool. It keeps us organized, productive, and effective. I especially like the options of seeing the agenda on my iPad and the option to add agenda items prior to the meeting. To me Clerk Tools is an indispensable tool to fulfill Elder Ballard's admonition "Second, be innovative. As we work to magnify our callings, we should seek the inspiration of the Spirit to solve problems in ways that will best help the people we serve. . . The instruction to magnify our callings is not a command to embellish and complicate them. To innovate does not necessarily mean to expand; very often it means to simplify" (O Be Wise, 2006.) Clerk Tools is innovative and has greatly simplified the work. Clerk Tools is great! Before Clerk Tools I would have to carry so many papers and notes to keep track of everything. Now I have one place I go to sort, track and record information for things such as callings, ordinations and assignments. And being web based, I can access it anywhere I have a device with an internet connection. One of the challenges faced by all Ward Clerks is the tracking all of the assignments, callings, ordinations, and keeping everyone on the same page. 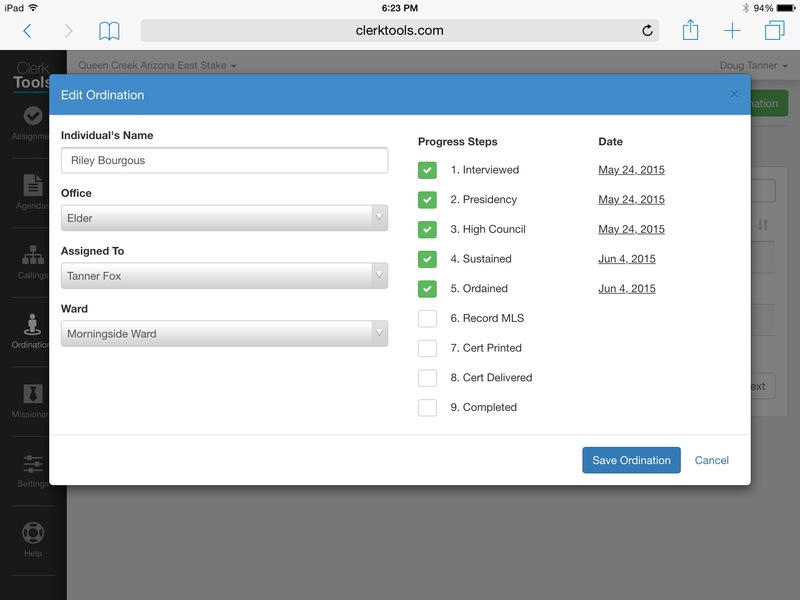 Clerk Tools is simple to use and has brought a level of organization to our Ward that has resulted in more efficiency and accuracy in all of our assignments and records. I highly recommend it. Clerk Tools reduces pressure and makes us more effective. It helps us be sure that the multiple steps in things such as callings, priesthood and missionary preparation schedules, are completed on-time. We can know where we are in these processes at any time. As busy as we all are, this program is a welcomed assistant in our duties. 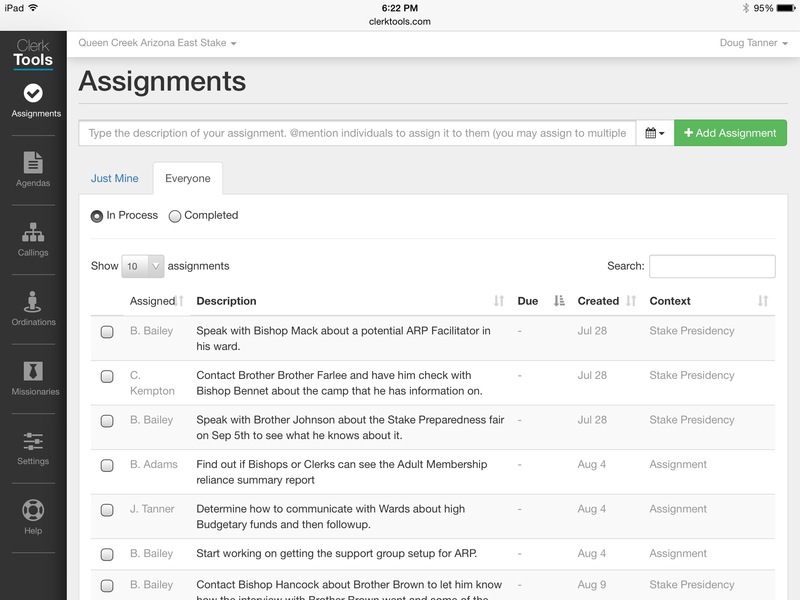 Clerk Tools helps us stay organized and move the work along. 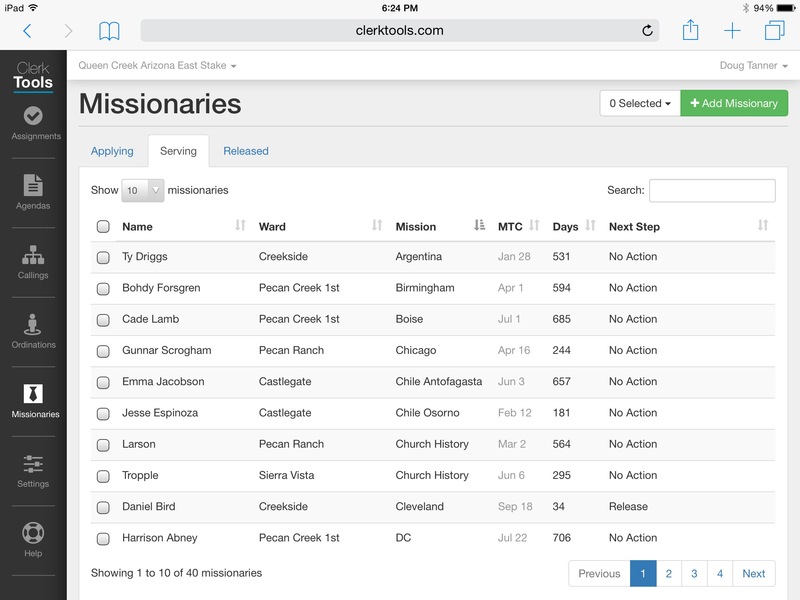 It tracks callings, ordinations, missionaries, agendas, minutes and assignments and has helped ensure that these important items don't fall through the cracks. It is nicely tied together for those that are not as technically inclined bi-weekly emails to help everyone stay up to date on minutes and on top of their assignments. I can see a ton of potential here. I love being able to keep things all in one place. It was easy to use from the minute I started. Everything my stake president needs me to do, its all right here. These guys have really nailed it! We empower keyholders in our wards and stakes to reach further than ever before. We strive to provide the best tools so that wards and stakes can hasten the work in their respective stewardships. Copyright © 2018. Clerk Tools is a service of 8873, LLC. All rights reserved.